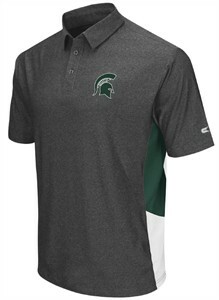 This Michigan State Spartans Heather Charcoal Synthetic Polo Shirt by Colosseum is great for any activity you may choose because of its moisture wicking fabric that keeps you nice and dry no matter how hot it is on game day or on a round of golf. So you can show off your team collegiate pride this golf shirt features a rubberized print on the left chest team graphic and color contrasting side panels made from 100% Polyester Pique. Made from 92/8 Polyester/Spandex material this regular fit Polo will show off your team pride anywhere you want.